Cech has confirmed he’ll retire at the end of the season after an illustrious career but unfortunately he won’t get another chance to face his former club as Leno is expected to start in goal versus Chelsea tomorrow. Arsenal have options at the back after the return of several defenders from injury. Emery went with Mustafi, Sokratis and Koscielny in a back three against West Ham last week and he’ll probably stick with that trio tomorrow. However, I’d like to see Monreal come in against Chelsea. He’s comfortable playing centre-back and the fact he’s left-footed would give us a lovely balance rather than playing with three right-footers at the back. Koscielny could then move in to the middle of the back three with Sokratis on the right as I’d drop Mustafi. The German defender still has a tendency to dive in too much and make stupid mistakes. I was surprised Bellerin wasn’t recalled against West Ham last week after recovering from a calf injury. Maitland-Niles had a poor game at the London Stadium so I hope we see Hector return in the right wing-back position against Chelsea as I think he’s been a huge miss in recent weeks. Kolasinac should continue on the left while Torreira has to be recalled in the middle of the park after being left out against the Hammers. Xhaka had another nightmare last weekend but I don’t think Guendouzi is ready to play week-in, week-out so we’ll have to stick with the Swiss international. All eyes will be on Emery to see if he recalls Ozil after once again axing him from the squad for our defeat at West Ham. I get why the boss has dropped him as Ozil can be a ‘luxury’ player at times and he doesn’t really it Emery’s system. 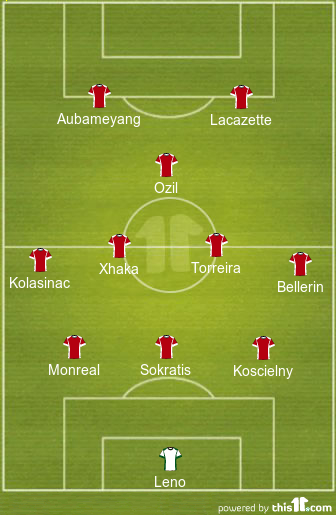 However, it’s obviously we lack creativity without Ozil in the team. This mess can’t continue much longer and I’d love to see Mesut start in the No.10 role tomorrow. Some of his best performances have come in the big games at home so I think Emery should give him the chance to perform on the big stage against Chelsea and prove he deserves his place. Ozil playing in behind a front two of Aubameyang and Lacazette could be a dream attack IF Mesut puts in the hard graft when we’re not in possession and we can get the ball in to him often enough to hurt the Chelsea defence. However, the chances are Emery will probably play with Lacazette up front and put Aubameyang and Iwobi on the wings tomorrow. Mkhitaryan is due back in training next week but for now he remains out along with Welbeck.